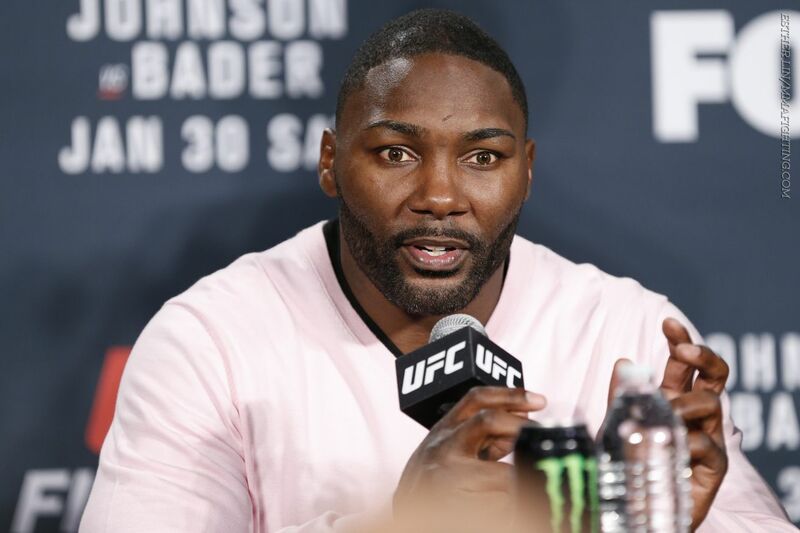 NEWARK, N.J. – With Anthony Johnson staking his claim for a light heavyweight title shot on Saturday night by knocking our Ryan Bader in less than 90 seconds, the question became — how long was he willing to wait for a title shot? After putting away Bader Saturday night at UFC on FOX 18 in Newark, “Rumble” Johnson said he will be very patient if he was asked to be. When asked if he was comfortable waiting out the timetable for the tentatively slated title fight between current 205-pound champion Daniel Cormier and Jon Jones in April, Johnson said he was. Johnson (21-5) lost to Cormier at UFC 187 via third-round submission (rear-naked choke), yet has never faced Jones, whom he was supposed to face at that very card. The fight remains an intriguing one, yet so does a rematch with Cormier after Johnson has rattled off back-to-back wins over Jimi Manuwa and Bader. Yet even though he said he was happy to wait, Johnson made it clear he was willing to fight again before a title shot if he was asked. “Yeah, as a paycheck,” he said. Johnson said he was willing to hold tight for now, but not that he would wait the time line no matter what.